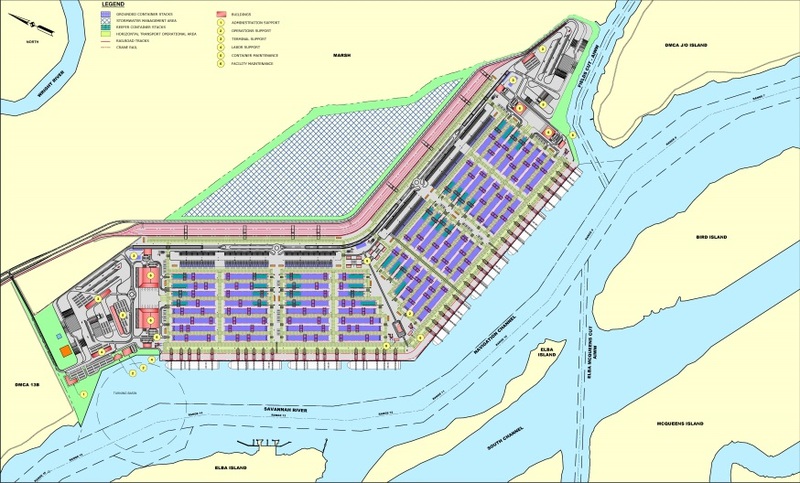 The proposed Jasper Ocean Terminal (JOT) includes the construction and operation of a marine container terminal on an approximately 1,500-acre site along the north bank of the Savannah River in Jasper County, South Carolina. The JOT would increase the region’s capacity to efficiently handle the forecasted cargo throughput into the hinterland market region over the next 35 years. The Georgia Ports Authority (GPA) currently operates the Garden City Terminal, approximately 8 miles upriver from the proposed JOT site, while the South Carolina Ports Authority (SCPA) operates several container terminals in Charleston, South Carolina, such as Wando Welch, Columbus Street, and North Charleston. Even with the opening of SCPA’s Hugh Leatherman Terminal in 2019, both ports forecast the need for additional capacity to handle projected future containerized cargo throughput and minimize future operational limitations and efficiencies at the current and future ports’ facilities. The proposed JOT would be a state-of-the-art marine container terminal using efficient and sustainable technologies to transfer containerized cargo between container ships, over-the-road trucks, and intermodal rail cars. Elements of the terminal would include a pile supported wharf to accommodate approximately eight Neo-Panamax containerships, a container storage yard, intermodal rail yard, gate facilities to process entering and exiting over-the-road truck traffic, administrative buildings, and equipment service facilities. The proposed JOT would also include elements common to industrial sites such as a water tower, underground utilities, electrical substations, backup generators, high-mast lighting, stormwater management facilities, perimeter fencing, and parking areas for personal vehicles. Proposed transportation improvements that would serve the proposed JOT would include construction of a 4-lane divided highway corridor between the terminal and U.S. 17, a double track rail corridor between the terminal and existing CSX Transportation (CSX) and Norfolk Southern (NS) rail lines, and a new rail bridge across the Savannah River. Utility lines and intermediary facilities are also proposed to connect the terminal to existing services. Likewise, navigation improvements associated with the proposed JOT include new work and maintenance dredging of berths, an access channel, and a turning basin to provide vessel access to the terminal, and shoreline stabilization, bulkhead, and wharf construction adjacent to the existing Savannah Harbor federal navigation channel. According to the JOT Joint Venture, a separate feasibility study will evaluate the costs and benefits of modifications to the existing Savannah Harbor Federal navigation channel. Should this feasibility study or the Corps’ analysis of the proposed JOT determine that modifications to the federal navigation channel are required to operate the proposed marine container terminal, potential impacts to the human and natural environment (e.g., aquatic resources) associated with any navigational improvements will be evaluated and included in the EIS for the proposed JOT. Operations on the terminal site would be performed by ship-to-shore cranes on the wharf, rail or rubber-tired gantry cranes within the container and intermodal yards, and horizontal transport equipment such as terminal hostlers or shuttle carriers. Based on the available information, the proposed JOT will result in the placement of fill material in waters of the U.S. and/or tidal marsh on the terminal site and the off-site roadway and rail connections and access corridors.